I have recently been feeling frustrated with reading some heavy books and, after a day or two, completely forgetting what I read. It's as if the hard work I put into understanding the text was vaporized. But now I'm trying something new. 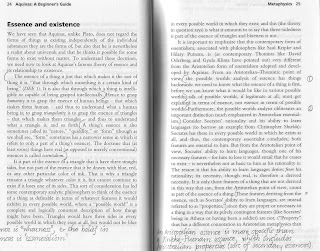 The idea is basically to annotate each page of the book with a sentence or two, at the bottom, with a key insight or summary for the page. You could also add clarifications from the web or from other books, or pretty much whatever you like. In effect, you're keeping a sort of running commentary in the bottom margin of the book. "Running commentary" in Latin is "Commentarius cursor", so I think that an appropriate name for this method would be cursocommentarial reading. Why do it? It keeps you awake, since you must pay attention to get the key insight from each page. As a bonus, you can come back weeks later and instantly refresh your memory about the book by glancing down at your annotations. Note that this will slow down your reading (which is not necessarily a bad thing), so you will want to save this technique for books that deserve a close reading. Below is an example of cursocommentarial reading. Note the brief annotations that I put at the bottom of each page. posted by Jonathan at 7/24/2011 08:59:00 p.m.
You've a very beautiful handwriting. Sometimes it is hard to summarize things to one page. But yes, it would be very helpful to remember what the book says. While reading hard books(non-fiction and some fiction with philosophical implications), I sometimes write down details in a small note book chapter wise. Re-reading those notes makes me feel how I forgot most of what I've read. By Sujith Abraham, at 8/18/2011 10:53 a.m.
Ha - good point Sujith! It seems that I tend to write in the books for harder books, and in a notebook for easier books. By Jonathan, at 8/18/2011 1:28 p.m.